Requirements: OS4 - ffmpeg program must be installed first. MUIMPlayer, MPlayer or ffplay, optional. 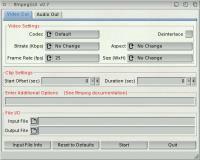 ffmpegGUI is a GUI for the ffmpeg program. user. It also allows for incremental development of the GUI. saving individual video frames as graphics files as well as the reverse. responsible for any damage resulting from it's use. Changed ffmpeg Version checking to not warn about versions greater then 2.x. 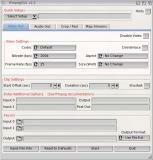 Updated "Picture_Audio->Movie(mp4) settings to produce higher quality video. Added suppport for Liveforit's MPLayer. Added 256k to audio bitrate selection. Added 9000k to video bitrate selection. VCD, SVCD, DVD setups in setup menu now use -target commmand. Corrected 'ktadd' logo height in about requester. Window now opens at center screen instead of under mouse. Updated to comply with latest SDK. Replaced obsolete functions. Fixed bug where AREXX port wasn't closed on exit.